Every sale is made or lost in 60 seconds make them count Cold calling and pushing your way into an office or a living room creates an atmosphere of adversity and distrust you must overcome before you close the deal. With those tired tactics, you re swimming upstream, against a strong current, with a bag of rocks tied to your waist. Sales has changed. Legacy sales gimmicks destroy relationships rig… ht from the first minute. The 60 Second Sale is a turnkey system for building profitable, lifelong relationships. Whether you work with affluent consumers or sell to senior executives in FORTUNE 500 companies, this step-by-step guide will help you open doors, close deals, and make more money in a way that leverages your natural strengths. That s the magnificence of the 60 second sale system. You get to be yourself and build your business. In this book you will discover: How to start a sales conversation in 60 seconds Who to target for immediate income A powerful yet easy-to-use system to generate relationship revenue Five ways to initiate new relationships What to say to make sure your business meetings result in money in the bank The secret to getting a yes every time, even in the most competitive sales environment The winning mindset that removes the stress, uncertainty, and fear from income generation And so many other effective business growth strategies, your competition won t know what hit them Business relationships are built one minute at a time. From introduction to closing, every 60 seconds you have an opportunity to strengthen your relationship or destroy it. Isn t it time you started leveraging your expertise, demonstrating your value, and building trust with your clients? When you do, they buy into who you are and how you can help them right from the first minute. 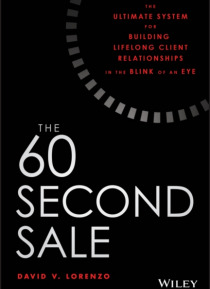 The 60 Second Sale is a fail-proof system for succeeding in today s relationship-focused sales environment.